Nordic Film Club comes for the seventh time with the traditional exhibition of Nordic film industry. The audiences can look forward to seeing the typical Nordic humor, raw crime stories, absurd dramas, historical films based on true events and genuine life stories on the silver screen. All these come with the typical music and the beauty of the Scandinavian nature. 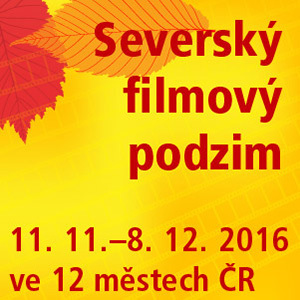 Festival will present premiere movies, less known and older films and even requested films returning from the previous years. Nordic Film Autumn offers 32 films from 6 Nordic countries – 12 Swedish, 9 Norwegian, 5 Danish, 3 Finish, 2 Icelandic and 1 Latvian. The opening ceremony with the cooperation of the Asociace českých filmových klubů will be held on 11th of November in Lucerna, Prague and the festival will open the premiere of the film A Man Called Ove. Touching dramedy about an unexpected friendship based on the book by Frederik Backman. Ove is stubborn and contentious man who terrorizes those around him, until one day, when an immigrant family enters into his life. One of the expected hits-to-be is a Danish drama The Idealist. Film focuses on a hidden chapter in the recent Danish history, showing the connection to the highest Danish and US political circles. Romantic film Rosita tells a story about a life in a small fishing village, loneliness and a love triangle. Swedish Hotel is returning after a successful showing at the Febiofest festival, bringing group psychotherapy to a different level. Worth mentioning are also two films by director Jan Vardøen; Comedy drama Høst: Autumn Fall follows a turbulent relationship of National theatre stage manager with a successful actor. Heart of Lightness references the stage play The Lady from the Sea by Henrik Ibsen, bringing absolutely unique cultural experience. From Finland comes a comedy Adult Camp about the intricate paths of personal growth, remake of successful Danish film Reunion and a stand-alone road-trip sequel Lapland Odyssey 2. Among the new films presented this year is Ignase Jonynase’s film debut The Gambler. It is the first Latvian movie presented during the festival. It will offer the audience to see the connection between two distinct worlds; emergency health services and gambling. Iceland movies are becoming a festival tradition. The comedy Albatross will take you to the charming surroundings of fishing village Bolungarvík and the Bolafjall Mountain. More of the Nordic humor arrives in the comedy about a son of a champion in going backwards, who prepares to drive through the Iceland Back-wards. Nordic Film Autumn also presents two acclaimed documentaries. Bikes vs. Cars focuses on global crisis, congested cities and constantly growing traffic chaos. It also presents the view of activists, who refuse stop driving cars despite the increasing number of fatal car accidents. Expedition Sweden tells a story about three friends, who are preparing to conquer Kungsleden, 450 km long trail in the Swedish mountains. The fans of horror movies will appreciate a ghost story The House set during the Second World War. Three soldiers will find refuge from cold and inhospitable Scandinavian winter in a house that will change into something entirely different. The festival has long been trying to meet the demands of viewers with hearing disabilities. All films are provided with color-modified subtitles. Each important character of the movie has its own color of subtitles. For the deaf viewers, so they can easily follow the movie, there is also information about noises and all the storylines that are out of focus and are important for understanding the plot. According to the response of all spectators, the colorful subtitles are welcomed, because they help in orientation in more complex dialogs. Organizers do not forget about foreigners - when showing in Prague, Brno and Ostrava, the films will be also provided with English subtitles. The festival is organized by the Nordic Film Club with the support of Ministry of Culture, Prague City Hall, Brno City Hall and embassies of the Nordic countries. ČR: Severský filmový klub přináší tradiční přehlídku severské filmové kinematografie již po sedmé. Diváci se mohou těšit na peprný humor seveřanů, mrazivé kriminální příběhy, absurdní dramata, historické snímky natočené podle skutečných událostí a ničím nepřikrášlené lidské osudy na stříbrném plátně. Filmové zážitky dokreslí svérázná hudba i krása skandinávské přírody. Uvedeny budou filmové novinky, méně známe snímky staršího data výroby a na přání diváků i vybrané úspěšné tituly z minulých ročníků. Severský filmový podzim 2016 nabídne 32 snímků z 6 severských zemí – 12 švédských, 9 norských, 5 dánských, 3 finské, 2 islandské a 1 litevský. Severský filmový podzim přináší také dva oceňované dokumenty. Filmový počin Kola versus auta popisuje globální krizi, města přeplněná auty a stále se zvyšující dopravní chaos. Nechybí ani pohled aktivistů, kteří odmítají přestat jezdit na kole i přes zvyšující se počet smrtelných dopravních nehod. Expedice Švédsko vypráví o třech přátelích, kteří se chystají pokořit Kungsleden, 450 km dlouhou stezku Švédských hor.